Family-friendly travel from New York. While a trip to Canada doesn't normally conjure a journey on the high seas to mind, it turns out, this travel option may be one of the most fun when embarking from New York City. A cruise enables everyone in your clan, from the youngest child to the most doting grandparent, to be together while enjoying ease of travel, age-appropriate entertainment and quality accommodations. Recently, Disney Cruise Line unveiled an excursion that leaves from Manhattan, travels along the New England coast, and ports in Canada's Nova Scotia and New Brunswick. Not only does the vacation offer enriching excursions that introduce kids to foreign cultures, but it also includes travel companions like Mickey, Minnie, Goofy, Captain Jack Sparrow and others. As an adult who's never had a traditional Disney experience, I found the journey to Canada to be charming for little ones and heart-warming for adults. I watched fireworks over the Atlantic Ocean while Disney pirates hosted an on-deck dance party, felt like a kid again during one of the many family-friendly musical performances, and sang karaoke to “A Whole New World” in front of a room full of strangers. While at sea, my family and I relaxed by the pool and hot tub, constantly ate, “ooh-ed” and “aah-ed” from our private balcony over dolphins we saw swimming alongside the ship, watched a 3D movie and lingered in various lounges, which often featured live entertainment. Our Canadian excursions involved visiting a historical museum and traipsing through local shops. Other available side tours included jet boat rides and trekking through a seaside village, but we were content to wander on our own. I was pleased to discover Disney offered a separate pool just for families with children, a nursery for tykes, programs for children, and hangouts just for tweens and teens. These care services filled with activities give parents the opportunity to try out services at the salon and spa. Dinners in the three different dining halls were indeed magical. As a vegetarian with a gluten-free dietary restriction, I was treated with extreme kindness and quickly accommodated. Often, there were too many meal options, so I'd end up with leftovers! My husband and I were able to get reservations for the exclusive on-board restaurant one night for a special date, and we even met the head chef. 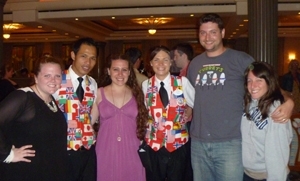 Suppers were sometimes accompanied by spectacular shows featuring our sweet servers. Other lines with Canadian destinations include Carnival Cruises, Princess Cruises and Holland America. Consult with a travel agent or log onto a travel planning site to book your getaway. All in all, my first Disney experience was an amazing one. It was certainly worth all of the strange looks I received when telling my friends that I was going on a cruise... to Canada. An unlikely destination for a ship from Manhattan? Perhaps. Would I do it again? Absolutely.